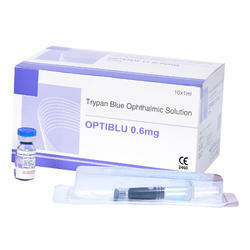 Our range of products include trypan blue ophthalmic solution and brilliant blue g solution 0.05%. *Sterile, Pyrogen free solution of trypan blue. *Indicated for staining of ocular tissues during capsulorhexis and retinal surgery. *Reduces risk of complications due to inadequate visualization of the membranes. *Very low volume required for staining. *Easy visualization of ocular tissues. 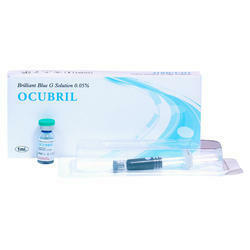 Ocubril is a sterile, pyrogen free blue coloured aqueous solution. Selectively stains the ILM to facilitate the complete peeling, require to repair macula holes during the retinal surgery. Ready to use solution with a concentration of 0.05% w/v Brilliant Blue with buffered solution.